The Gog Blog by Rory Spears, Editor and Director of Content. Follow Rory on Facebook, Linkedin and Twitter @GogBlogGuy. On the 16th tee at Whistling Straits. Steve Orrick the Director of Golf at the Country Club of Decatur,took the first round lead of the 93rd Illinois PGA Section Championship, at Medinah. Orrick who played in the afternoon, carded a 4 under par 67, the new competitive course record. 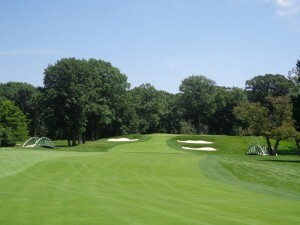 The championship is being held on the recently renovated Medinah No.1 course, named the “Camel” course. Welcome to Medinah Country Club, home of the 93rd Illinois PGA Section Championship. The first drives of the day were only held up 5 minutes due to the thick morning fog, that dissipated as the first groups were heading to the 1st and 10th tee’s. 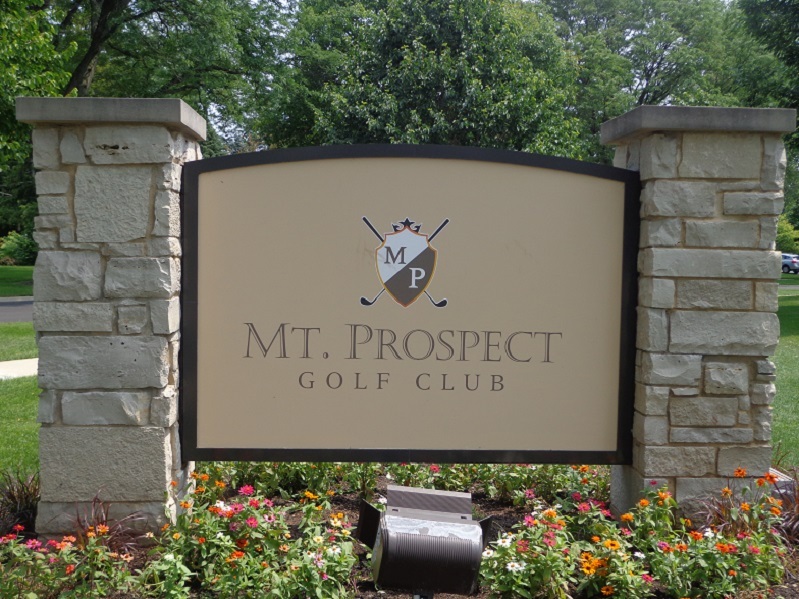 Jim Billiter from the Merit Club in Libertyville was first out and with greens in great shape, Billiter shot a 3 under par 68 to take the early lead. Billiter, the 2015 IPGA Match Play Champion, was quick to admit that he didn’t expect to be leading at the end of the day. Billiter was right, as he was caught but not passed by Matt Slowinski from Conway Farms, and Curtis Malm from the White Eagle Country Club. The only other player in the field in the field that broke par was John Varner from Beverly Country Club, he shot a 2 under par 69. No players were at 1 under par, but 4 players were at even par 71, including Medinah Country Club teaching professional Travis Johns. Eight players were sitting at +1 or 72. In the eight was University of Illinois golf coach Mike Small, the two-time defending champion, who has some work to do if he is going to win his 12th IPGA Section title. After his round Small went directly to the range while most of the other players called it a day. It would no surprise nobody if Small made a charge in Tuesdays second round, to get back in contention. In the clubhouse at 72, was Katie Pius who is playing while being four months pregnant. The field started with 136 players but there were 3 WD’s so the field has shrunk to 133. It will shrink again after Tuesday second round, when the cut is made. The top 60 and ties will tee it up for the final 18 holes. Tee-times begin at 7:30 AM. Final round play is expected to wrap up around 1:30 on Wednesday afternoon, with the the trophy ceremony following shortly thereafter. The Gog Blog by Rory Spears, Editor and Director of Content. Follow Rory on Facebook, Linkedin and Twitter @GogBlogGuy. Wearing the new Sunice Typhoon Jacket see more @ Sunice.com. Cap from Sand Valley, Mike Keiser’s new project under construction in Central Wisconsin. 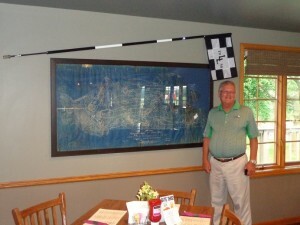 Photo by David Schuster, in the new 19th hole at the recently Re-Opened Glenview Park District Golf Course. They’re gone ! That’s right last week they were here, and now they are gone. Who is they, well the USGA is who I’m talking about, and they have not scheduled a return for the next three years at a minimum. All of the USGA Championship’s for the years of 2016-2017-2018 are gone and spoken for. Some of the 2019’s are gone as well, the U.S. Open is gone through 2024. Over the years the USGA has brought 60 of their championships to the State of Illinois, the last being the U.S. Amateur at Olympia Fields. But No.61 is nowhere to be found. It’s the first time in decades that no USGA event is scheduled for a Chicago area club, for the foreseeable future. Could an announcement be close on one, good question. During the recent interview with USGA President Tom O’Toole I took part in, O’Toole made it very clear how the USGA operates when it comes to selecting championship sites, and he should know, not just because he is the current president, but he is the former head of the executive committee and has served on the championship committee. USGA President Tom O’Toole speaks at the University Club in Chicago in 2014. Where the process starts to host any USGA championship, is with the clubs themselves. They have to send a letter with an invitation to even be considered. During the interview with O’Toole, he was asked if the USGA is getting invitations from Chicago area clubs. Since not being on the championship committee anymore, O’Toole doesn’t see every invite that comes in, but he did suggest to the media present for the interview, to spread the word to Chicago clubs, to send in their invites in to the USGA. It was suggested that maybe the USGA isn’t getting the amount of invites from Chicago area clubs that it once did. So I’ll help do just that. To all of our area clubs, if you like to see the USGA bring more of it’s championships to town, tell them. Fire off the letter and put that invitation inside. You won’t get the U.S. Open right away, or maybe not at all, but now there are FOUR U.S Open’s to pick from, any one of the four is a good feather in the cap of your club. Do you have two courses, or a neighbor close by that would be able to provide a great second course for championships like the Mid-Am or U.S. Amateur. If so the USGA just might want to hear from you. More than one golf course operator has told me over the years, that the golf business gets busier when tournaments come to town. Golfers get the urge to pick up the clubs a little more often. The USGA is located in Far Hills, New Jersey, for those who need to be pointed in the right direction. Medinah Country Club, the site of this weeks Illinois PGA Section Championship. SMALL for 12. 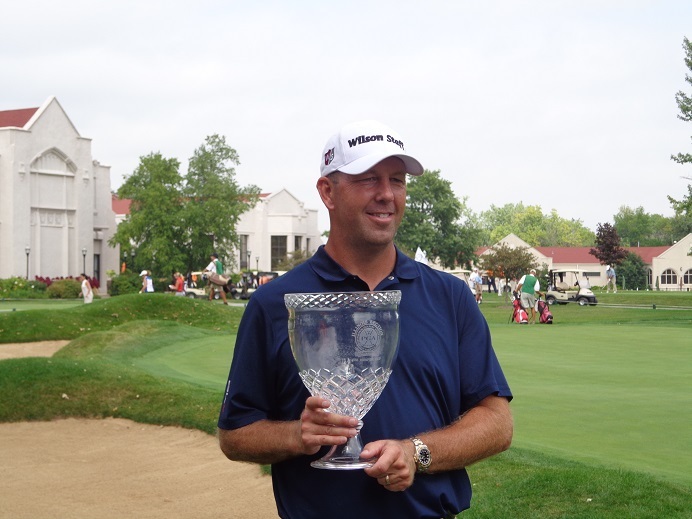 Yes, Illinois Golf Coach Mike Small is going for his 12th IPGA Section title this week on Medinah’s renovated Course No.1. I don’t know the last time I found that any golf had won the same tournament 11 times. 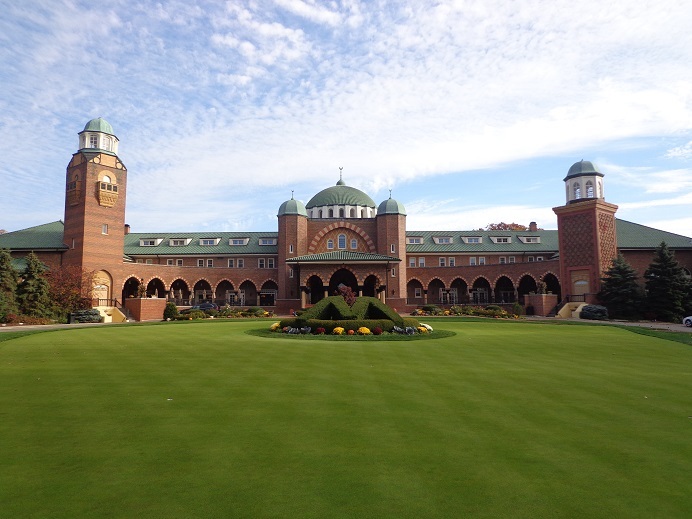 What is interesting is that Small did not win the last time the championship was played at Medinah. Will the renovation by architect Tom Doak change that, or can Westmoreland Country Club assistant professional Frank Hohenadel make it two in a row on the “Camel Course.” 136 players will be in contention starting at 7:30 Am on Monday morning. Best of luck to new IPGA Section Executive Director Carrie Williams as she overlooks the first major in her new position. Tick-Tick-Tick the final minutes of the Oak Meadows tee sign auction is winding down. 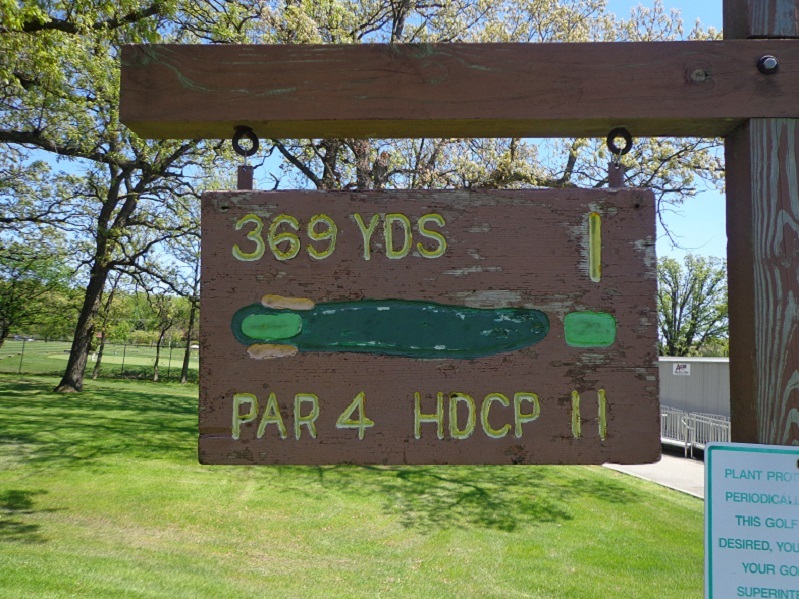 Did you put in your bid yet for your favorite hole at Oak Meadows. The money raised goes for charities connected with the DuPage County Forest Preserve District. 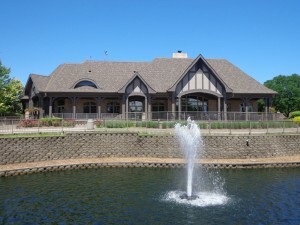 Log on to DuPagegolf.com and follow the link to the auction site to place your bid while you still can. You can still sign up for the annual Rambo Scramble coming in October, this testing but fun event fills up quickly. 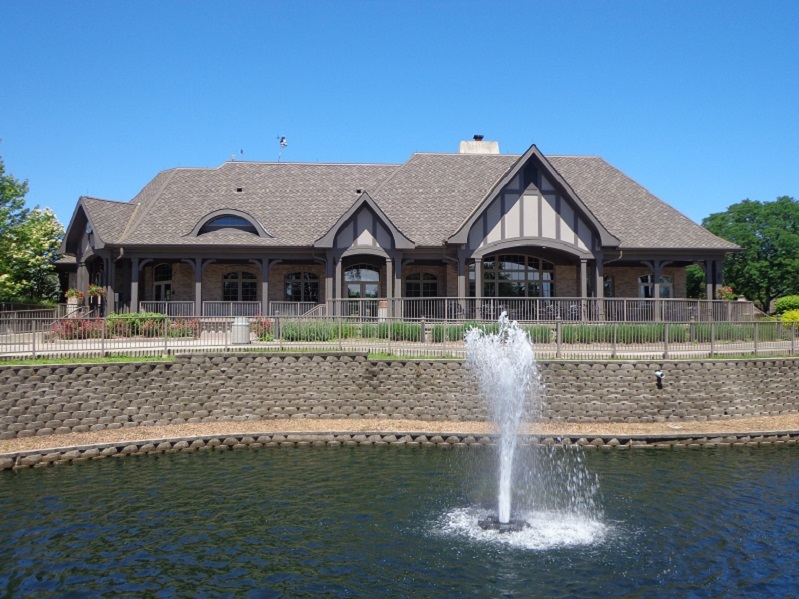 It will be played at Maple Meadows this year, with Oak Meadows being closed. CONGRATS TO JULI INKSTER on winning the LPGA Legends Championship at the French Lick Resort, follow Lenziehmongolf.com for more details and a full wrap up of the championship. Including Jan Stephenson’s win in the Super Legends category. SPEAKING OF THE LADIES..the LPGA UL International Crown gets a PR boost today, with the arrival of some players at Rich Harvest Farms, to tee off the campaign to promote next years big event in Sugar Grove. It should be the biggest golf championship in the Chicago area in 2016. 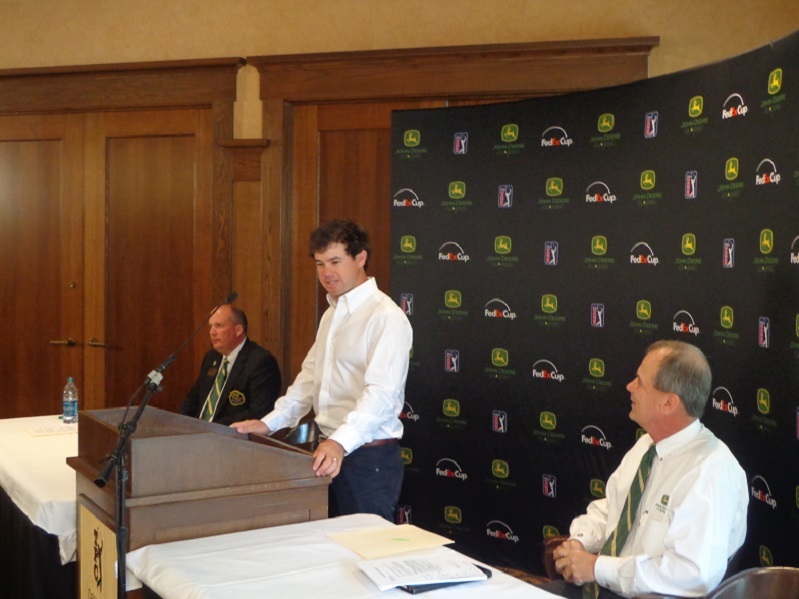 2014 John Deere Classic Champion Brian Harman, speaks at JDC media day earlier this year. A TIP OF THE CAP OR GOLF VISOR TO: 2014 John Deere Classic Champion Brian Harman on his sensational play yesterday in the final round of the Barclays Championship. Harman made not 1 but 2 holes-in-one over a span of 11 holes. I’m not sure what the odd’s of that are, but Harman might want to buy a lotto ticket as well. 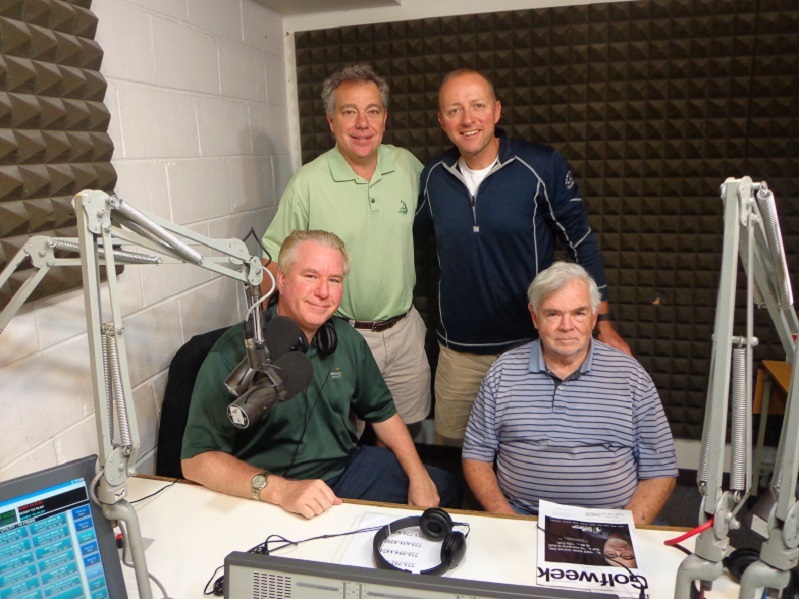 Golfers on Golf Radio, Standing L-R Mike Munro, Ed Stevenson, Seated L-R Rory Spears and Bill Berger. WSBC AM 1240 and WCFJ AM 1470 9 Am on Sunday’s through Sept. 20th. 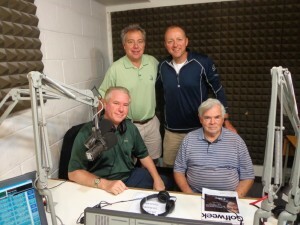 Golfers on Golf Radio this morning at 9 AM, we are on the tee box for week #20. We are past the first 18 and the 19th hole, just ready for that 4-hole playoff now. Our first guest will be Len Ziehm checking in from the French Lick Resort, where the LPGA Legends Championship is underway with Juli Inkster, Laura Davies, and Rosie Jones in the lead. The second guest will be our surprise guest, since it could be one of several people. The always mobile Len Ziehm, seen here in Wisconsin at Lawsonia GC, is live at the French Lick Resort this weekend. During the show we will hear the comments of U.S. Amateur Champion from Olympia Fields Bryson DeChambeau. In addtion some of the highlights of our interview with USGA President Tom O’Toole will air. If you miss us live because you are on the golf course or at the range, you do get a mulligan. The show will be reposted right here on the website under past shows, pull it up online this week when time permits. The Gog Blog by Rory Spears, Editor and Director of Content. Follow Rory on Facebook, Linkedin and Twitter @GogBlogGuy. 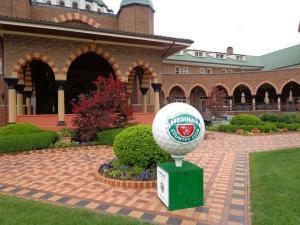 The 93rd playing of the Illinois PGA Championship starts on Monday at the Medinah Country Club in Medinah. 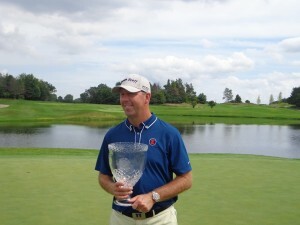 Illinois Golf Coach Mike Small is again the defending Champion. 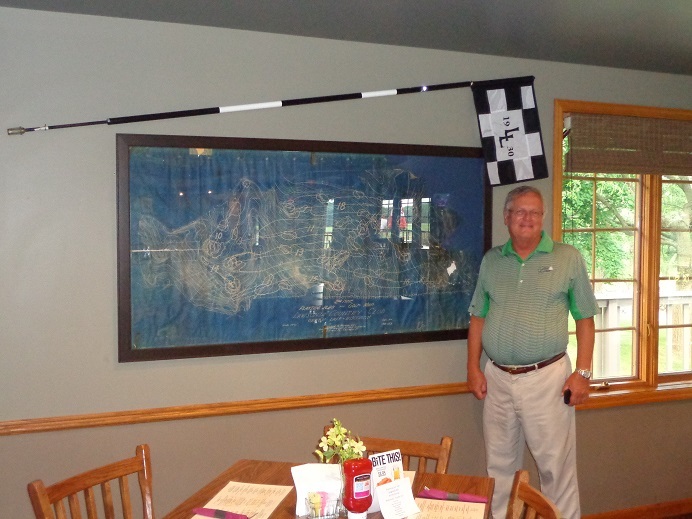 Last year at Stonewall Orchard Golf Club in Grayslake, Small won a record 11th IPGA Section title. In fact Small has won this championship so much, they could name the championship after him. But the last time the championship was held at Medinah, on the No.1 course, the course looked a lot different because architect Tom Doak had not yet started his renovation. That renovation is done now, and there are some new holes, re-routed wterways, less tree’s, white sand bunkers and more. Small didn’t win the last time the championship was at Medinah, current Westmoreland Country Club assistant professional Frank Hohenadel did. Hohenadel went low the first day and never looked back, and Smalls winning streak came to an end. Last year Small won by 5 shots over Steve Orrick from the Country Club of Decatur, and his 16 under par, set a record for shots under par. 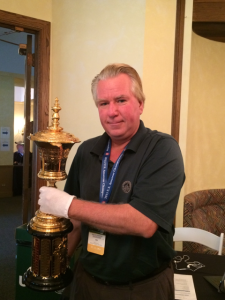 Small holds the trophy in 2013 at Olympia Fields, and in 2014 at Stonewall Orchard. Small will tee off in Round 1, in the afternoon flight. There are seven past champions in the field, including Hohenadel, Jim Sobb fresh off a win at the IPGA Senior Open, Doug Bauman, Gary Groh, Dino Lucchesi, and Orrick. Small comes into Medinah, after winning an IPGA event this past week at Cog Hill. Small and the other top finishers will receive a birth into the 2016 Club Pro National Championship (PPNC) at the Turning Stone Resort in Verona NY.. Small is exempt from qualifying for the championship as a three-time past champion. Nadler Golf carts will be the title sponsor of the championship. Rounds 1 & 2 start at 7:30 AM on Monday and Tuesday with a field of 136 players, then after 36 holes, the cut will be made and the remaining players will tee off on Wednesday starting at 7:30. Small was not sure if he would play the new Medinah Course No.1 before the championship, but promised to be ready. For more information on the full field of 136 players, please visit IPGA.com. There is directions to Medinah and information for spectators, admission is free. The Gog Blog by Rory Spears, Editor & Director of Content. Follow Rory on Facebook, Linkedin and Twitter @GogBlogGuy. With the new Typhoon Jacket by Sunice, See Sunice.com for details, Cap from Mike Keiser’s Sand Valley, now under construction in Central Wisconsin, at the recently reopened Glen View Park District Golf Club in Glenview. The Sunice Company has created a new 2015 Pro Sport and Sports Layers collection. The new line is focused on providing golfers the best collection of outerwear on the market. Sunice addressed the needs of the golfer everywhere, and allow’s them better playing performance while enjoying the comfort they provide. During a recent round of golf, I took the opportunity to research two items from the new line of outerwear by Sunice, the “Typhoon Jacket” and a new item from the Sunice pullover line, called “Sport” (pictured below). Gog Blog Editor Rory Spears in the new “Sport” Pullover by Sunice, see more at Sunice.com. Photo by David Schuster at the recently reopened Glenview Park District Golf Club. Due to the weather I encountered that day, both pieces of outerwear came in handy. The round started Mid-Morning and was on the cool side (60’s) and then warmed up into the 70’s. But an approaching weather front cooled things down again, before my partner and I finished all 18 holes. I switched back and forth between both pieces, and found both of them to be extremely comfortable, especially the Typhoon Jacket, which for a long sleeve piece of outerwear, still left me comfortable and was flexible when I hit the ball with every club, from Driver to Putter. I’m glad the rain never fell while I was playing my round of golf that day, but I’ll wear one or both pieces the next time I run into a drizzle on the course, and need my Sunice Outerwear to keep me dry while I’m still out in the rain playing. There are a variety of colors to pick from and different styles as well. I admit that the straight black Typhoon Jacket is more my style than the louder colored Sport Pullover was, but different strokes, or in this case colors, for different folks. But at least while wearing the bright green Sport pullover, I knew if the skies darkened anymore, any golfer rushing behind me to get in the clubhouse in case rain fell, wouldn’t have any trouble spotting me anywhere on the golf course. 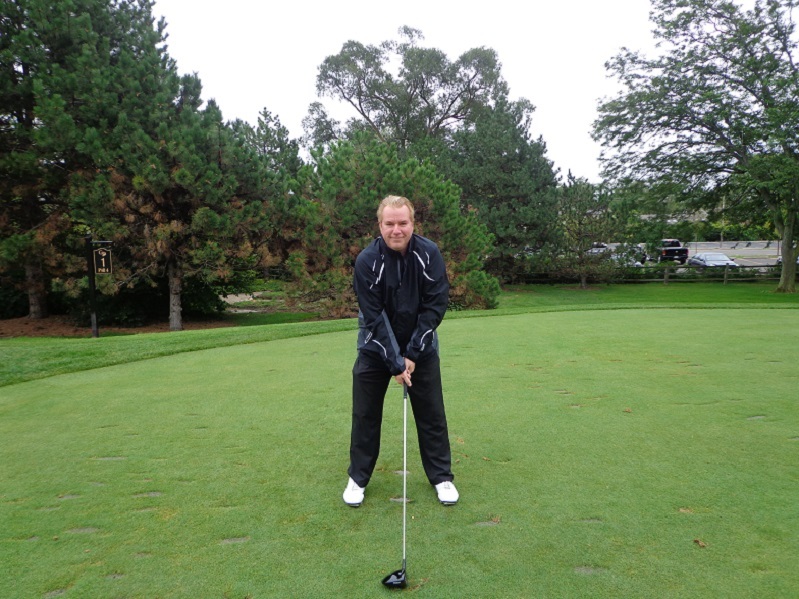 Pulling the big stick while wearing the Typhoon jacket, on the 1st tee at the Glenview Park District Golf Course. See Sunice.com for more details on Sunice products,made for all golfers. In the men’s collections Sunice is exploring a newness in demand for brighter colours. Whether it’s the neon-green or vibrant blue, there is now more to pick from than the older traditional colors of Black, Blue or White. Ladies, Sunice has not forgotten about you either. While the idea with the new colors is to embrace your femininity, the colors have been enriched to have a bolder look to them. Neon pinks with a classic white grounded with a charcoal flavor, give you a look that’s new and bold at the same time. The Blue Burbank (L) and the Candy (R) are more samples of the styles made by Sunice. Sunice calls the new lines the “Sports Layers” Collection. Need to wear one or more pieces of outerwear on a given day. Sunice designs allow you to do that, while still having comfort and flexibility to hit the golf ball. I know as I head into the fall golf season and the temperatures dip, my Sunice Golf outerwear will be kept in the bag or in the cart for that part of the season. So when you visit your pro shop or local golf store, and want to have the right look, feel, or comfort on the golf course in a variety of conditions or at the 19th hole. Ask for Sunice. The Gog Blog by Rory Spears, Editor and Director of Content. Follow Rory on Facebook, Linkedin and Twitter @GogBlogGuy. Wearing the new Typhoon jacket from Sunice Golf Apparel, visit Sunice.com, logo’d hat from Mike Keiser’s Sand Valley under construction in Central Wisconsin, in the newly reopened 19th hole at the Glenview Park District Golf Club. Photo by David Schuster. Have you ever complained about the pace of play at your local golf course, well who hasn’t. Well if you are tired of that,a nd would rather get tired yourself at the pace you do play, well why not try speedgolf. Yes, Speedgolf and the world’s best are coming to the Glen Club in Glenview this October 19th and 20th. How fast are world’s best Speedgolfers. This past week SpeedGolf International held an event that let people see World Champion Eri Crum in action. Crum played the par 4 16th at the Glen Club in just under 2 minutes, then he played the par 3 17th hole in just 1 minute and 7 seconds, the par 5 18th hole in just over 2 minutes. Crum played 16-17-18 in less than 5 minutes. To keep up with him, you needed a golf cart, and that wasn’t almost fast enough, especially on the 18th hole where Crum’s approach shot only left him a short birdie putt. Crum running to his golf bag, after making a bogey on the Par 3, 17th hole at the Glen Club. Crum played college golf at Stanford with Tiger Woods, no he hasn’t challenged Woods to a SpeedGolf game just yet, but Crum admits after all the knee surgeries Woods has had, it’s not likely Woods could keep up with him anyway. Crum was always athletic and a runner in addition to being a golfer. So SpeedGolf made sense for him, and he started playing the sport right after he learned about it. What SpeedGolf is, is a combination of your golf score, added to the time it takes you to get around all 18 holes. In our interview with Crum, he explains the game that is growing in popularity around the world. Click here to hear the Interview with Eric “Eri” Crum, a national champion at SpeedGolf. SpeedGolf golf bags are thinner, lighter and packed in a way that helps keep the weight down. 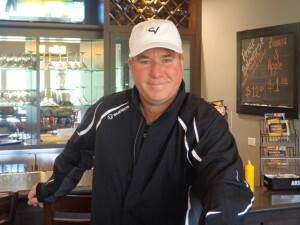 For more on how and wear to play Speedgolf, See SpeedGolfInternational.com. Come see Eri Crum and best players in the world at the Glen Club in Mid-October. 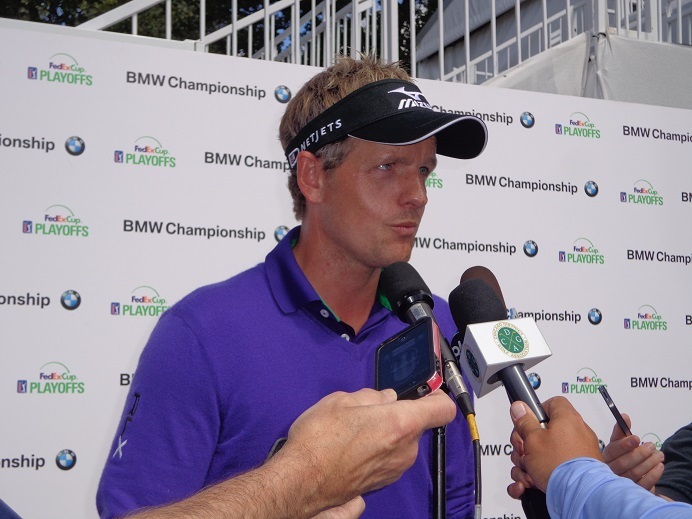 LUKE DONALD READIES FOR PLAYOFFS, RETURN TO CONWAY ? The Gog Blog by Rory Spears, Editor and Director of Content. Follow Rory on Facebook, Linkedin and Twitter @GogBlogGuy. 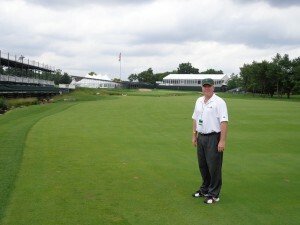 On the 18th hole at Conway Farms site of the BMW Championship in September. The below interview with Luke Donald was done right after the completion of the final round at the PGA Championship at the Whistling Straits golf course. During the interview Donald talks about just being inside the Top 125 to qualify for the Fed Ex Cup Playoffs (which he did #119). Where his game is at, after returning to Coach Pat Goss. 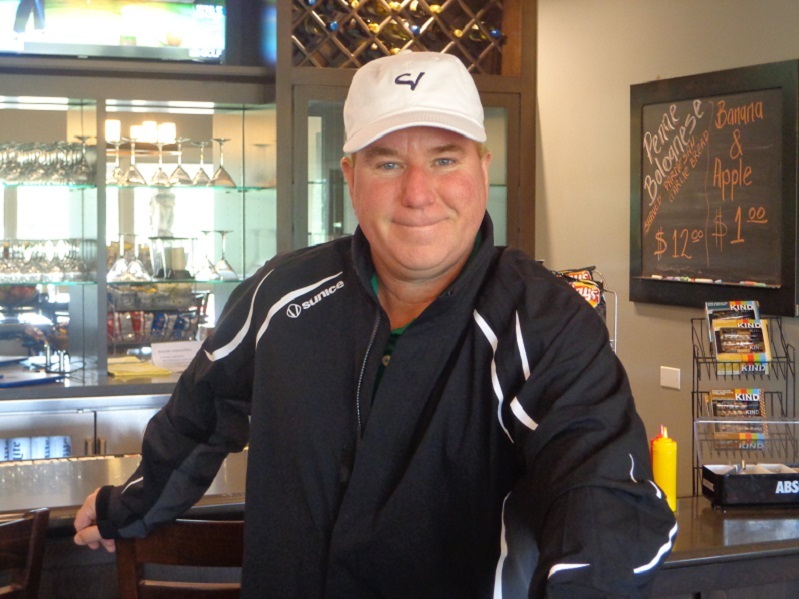 Donald is a member at Conway Farms, and was active with the recent course changes and practice areas, consulting with architect Dennis Wise, who previously worked with Tom Fazio Design when Conway Farms was built. Luke Donald after his final round at Conway Farms at the 2013 BMW Championship. In 2013, Donald got off to a slow start at his home club, and put on a big rally in the final day to finish Top 10, and move into the Top 30 playoff positions, so he was able to play in the Tour Championship at East Lake the following week. Donald is not only hoping of being in the field at Conway Farms this year, he is hoping to take home the championship trophy. Click here to hear the interview with Luke Donald, about Conway Farms, The PGA Tour and Fed Ex Cup Playoffs and the state of his game. Coming up this week, stay clicked in for our interview with Jim Furyk as he recounts his famous day and 59 from Round 2 of the 2013 BMW Championship at Conway Farms. The Gog Blog by Rory Spears (L), Editor and Director of Content. 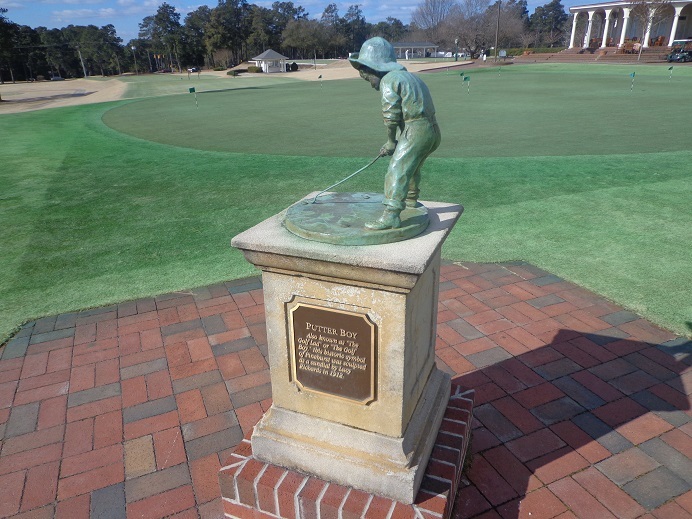 Follow Rory and his Golf Travels on Facebook, Linkedin and Twitter @GogBlogGuy. 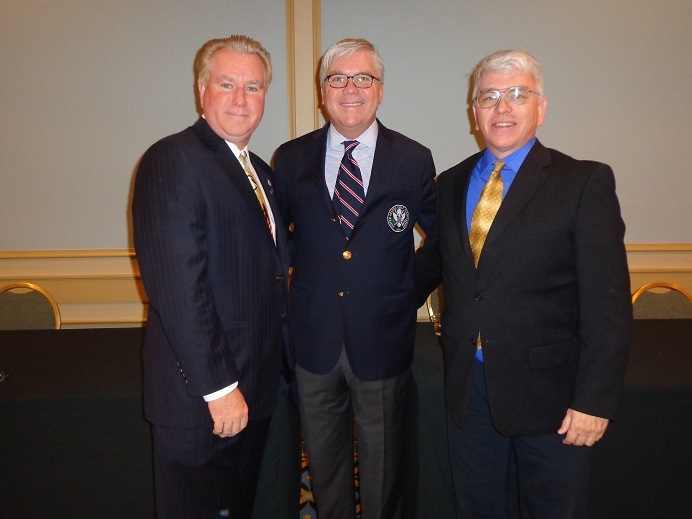 With USGA President Tom O’Toole (M) and Tim Cronin of the Illinois Golfer (R). Editors Note: During the recent U.S. Amateur at Olympia Fields, USGA President Tom O’Toole spoke with the Chicago’s major golf outlets, including Golfers on Golf, The Illinois Golfer, The Daily Herald, Chicagoland Golf, and the Chicago District Golf Magazine. O’Toole is in his second year of a 2-year maximum term as USGA President, his term will end in 2016 at the annual USGA meetings when the new president is then elected. O’Toole has been with the USGA for 27 years, and is a partner in a St. Louis Missouri, based law firm. 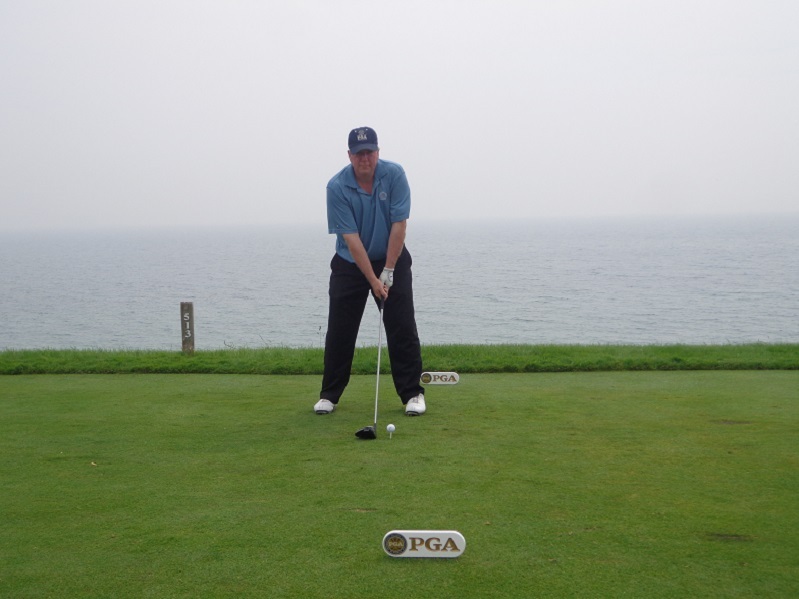 Formerly, O’Toole served as USGA Secretary in 2010, then as Vice-President from 2011-2013. The Chicago based media outlets that met with O’Toole, thank him for taking time to speak with the media during a busy week at Olympia Fields. O’Toole took all questions that were asked, and did not decline any of topics or issues that were raised. 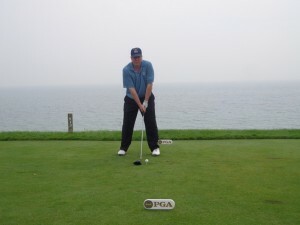 USGA President Tom O’Toole at the University Club in Chicago, in 2014. Among the topics and questions that were asked include the following. The week at Olympia Fields, and how the club had done as a U.S. Amateur host. The U.S. Open, and the recent 2022-2023-2024 site announcements, the lack of U.S. Opens in the Midwest, the fact that no USGA Championships area scheduled in the years ahead for the Chicago area, for the first time in several decades. O’Toole was asked about the new TV broadcast deal with Fox Sports, the newly announced U.S Sr. Women’s Open that begins in 2018, the USGA and how it monitors the equipment golfers use to play the game, and the addition of the new Jack Nicklaus Wing to the Golf House Museum on the USGA Campus in Far Hills New Jersey. Click here to hear the interview with USGA President Tom O’Toole from the Olympia Fields Country Club at the U.S. Amateur. Hear more of this Interview this coming Sunday on Golfers on Golf Radio, teeing off at 9 AM on WSBC AM 1240 and WCFJ AM 1470 Chicago. The Gog Blog by Rory Spears (L), Editor and Director of Content. Follow Rory on Facebook, Linkedin and Twitter. With USGA President Tom O’Toole (C), and Tim Cronin of the Illinois Golfer and a BIG 3 Partner (R). The group in the picture to the left, reunited this week for a talk about and the USGA. There were plenty of other topics covered as well, and you will hear them coming up on the Gog Blog over the next couple of days. I’d like to Thank O’Toole for taking the time to meet with us, it’s amazing how many meetings and responsibilities the USGA President has during the week of the U.S. Amateur. O’Toole met with the major golf media outlets in the Chicago area. Golfers on Golf, Illinois Golfer, the Daily Herald, Chicagoland Golf, and the Chicago District Golf Magazine. Among the topics that were covered, were U.S. Opens, and the tournament site selection process, being President of the USGA, over-seeing golf balls and equipment, the new U.S. Sr. Women’s Open, the new Fox-Sports Broadcasting deal, the 3 newest U.S. Open locations, Olympia Fields and more. Tim Cronin will have it on Illinois Golfer, and Len Ziehm will have excerpts in the DH, and for Chicagoland Golf. We hope you will check out what the president had to say. U.S. 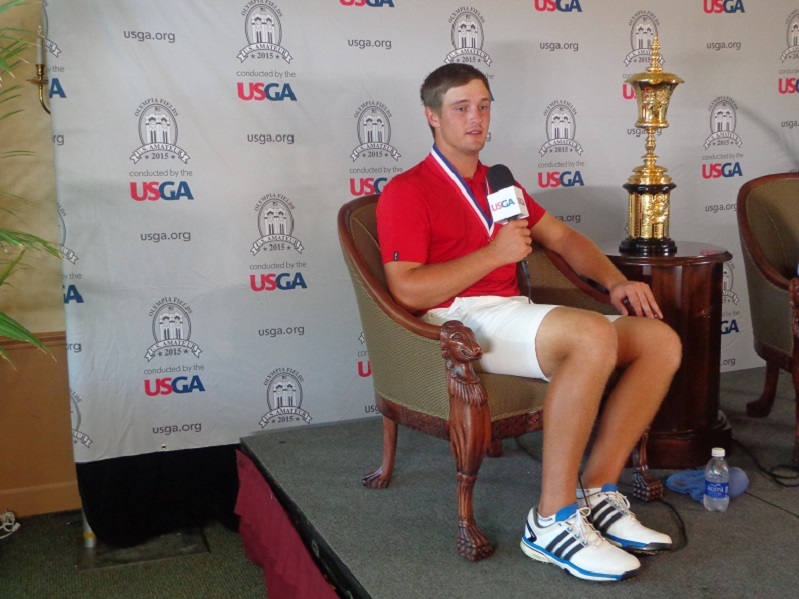 Amateur Champion Bryson DeChambeau talks about winning the U.S. Amateur Championship. He is interesting, he is unique and HE is the U.S. Amateur Champion. Bryson DeChambeu of California, the SMU Golf Team, and the U.S. Walker Cup Team is a name you should remember. DeChambeau is very well spoken and has some unique theories on golf balls, (the physics major, tests them in water with Epson salts and takes about 4 per dozen out of play) he has clubs with all Irons the length of a 6-Iron. Down the road somewhere if DeChambeau isn’t playing professional golf, he will likely be designing golf products for professionals. Watching him over the week it became apparent when he took down Maverick McNealy in the Quarterfinals he was ready to win. While USC’s Sean Crocker and Virginia’s Derek Bard played well, they just didn’t stack up to the level DeChambeau was playing at. One thing DeChambeau did tell the media, is that he walks fast, and that’s on purpose to make the other play feel like he has to play catch-up or get the feeling he is behind. Which is fine, but when other players like Crocker especially, or Bard walked off the green to the next tee and left DeChambeau to finish the hole, the folks at Fox-TV made an issue of it. WRONG, if there was some gamesmanship going on, let it go both ways. I think Fox made villain’s of Crocker and Bard when they didn’t have to. As for Fox I enjoyed Greg Norman’s comment about DeChambeau’s drive on 19 was probably in a freight car going the wrong way, while nobody knew where DeChambeau’s drive was, until it eventually turned up deep in the bushes. OLYMPIA FIELDS next stop.. no it’s not the train stop just left of the first tee on the North Course, but it’s the Ladies LPGA, and I’ll have more on that as the week goes on. What Olympia Fields Courses did was show themselves off very well. A Tip of the Cap or Golf Visor to Grounds Director Sam McKenzie (one of the best in the business) and his crew for keeping both courses in great shape, 4.5 inches of rain fell over the week. U.S Open status, some clubs that host an amateur get a U.S Open in about 5 or 6 years, that won’t be the case for OFCC. The U.S. Open is handed out for the next nine years, and the USGA may take a break now for a while in handing out the next one. For some who still think because of the security bill that showed up in 2003 from Cook County for the U.S. Open will keep another open from returning. Some reports of $900,000 or a million are a little high, cut those numbers in half and you are a little closer to the real figure. Well Guess again. The fact that the lowest number of the week was 66 on par 70’s courses, and courses held up great under the weather, green speeds were just under 13, where the USGA wanted them, and that some reports said the USGA told the club, that Olympia’s greens were the best of any at any USGA Championship played this year. Doesn’t that count for something, U-Betcha it does. If the U.S Open is not returning someday, it’s because there is not enough space for hospitality on the golf course, or hotel rooms and restaurants in the area. Yes I know what was done at Merion, but that format doesn’t just work everywhere. Check out our interview with Tom O’Toole for more on that. BUT IF, the PGA is now going to be the avenue of choice, you can put that U.S Open at another choice. It’s been said that after the LPGA is played at OFCC in 2017, a Sr. PGA is next, followed by a PGA Championship. Dates and time TBA. Stay tuned. FUNNY STORY OF THE WEEK, was the one from the Rochester New York paper that said the 2023 PGA was coming back to Oak Hill, well that’s not funny. But what was funny is that the writer said the club wants a U.S. Open, but is getting rebuffed by the USGA because their market is not big enough to be a big revenue generator for a U.S Open. Say What ????? Sure, first off the USGA would never tell a club that, and then the USGA takes the open to only big markets? I wonder if the writer has ever been to those big metropolis sized cities of Pinehurst North Carolina, and Erin Wisconsin. NO LOVE for Tiger. 51 year old Davis Love III won the final PGA Tour event of the season, and played his way into the Fed Ex Cup playoffs. “Playoffs”, yes they start this week at the Barclay’s. Tiger Woods played well this week against a field that has improved at this event over the years, but is still not a strong as many. 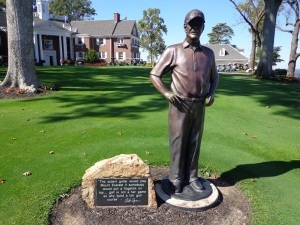 The par 70 classic style Donald Ross course isn’t regarded as real tough either. Woods needed a win or a solo second place to make the playoffs, he got neither after heading into the weekend T-1. But as Woods has done on the weekends he has stuck round for (few and far between), he went backwards. But give him credit for making a final push. But as Sunday turned into Monday, Woods now says his hip is bothering him, which could be leading into his lower back as well. If Woods needs more time off to get healthy, he will now have it. Too bad for Dan Hicks NBC/Golf Chanel, better off for the fans who want to hear about today’s stars like World #1 & 2 Jordan Spieth, and Rory McIlroy, and players like Jason Day or Zach Johnson. It was amazing to hear how the tournament “printed” 49,000 more tickets when Woods said he was going to play. Some of those actually got sold, remember printed is not sold. THIS WEEK, the LPGA Legends Championship is at the French Lick Resort in Indiana, but locally it’s a week of from tournaments for me, for the first time since the 4th of July weekend. But I’m right back at it next week at Medinah, for the Illinois PGA Section Championship. With the BMW Championship not far behind, I thought that would be the end of the golf tournament season in Chicago. Not so, the US SpeedGolf championships are coming to the Glen Club in mid-October, I’ll have more on that shortly as well. What they play for, The U.S. Amateur Trophy, the Havemeyer. The Gog Blog by Rory Spears, Editor and Director of Content. Follow Rory on Facebook, Linkedin and Twitter @GogBlogGuy. At Olympia Fields Country Club, site of the 115th U.S. Amateur. It took a little longer than planned because of a 47 minute weather delay, and during that time .47 of an inch of rain fell, but when it was over, Bryson DeChambeau defeated Derek Bard by a 7 & 6 score. By winning the U.S. Amateur in the same year he won the NCAA Championship, DeChambeau joins a small club of four other players to accomplish the feat. That list is Jack Nicklaus, Phil Mickelson, Tiger Woods and Ryan Moore who was last to complete the feat in 2004. DeChambeau from California, and a member of the Texas based Southern Methodist University golf team had his day end, much like the way it started by winning holes. But along the way Derek Bard from New York, and a member of the University of Virginia golf team made it tough on the eventual winner for a good part of the 30 holes. 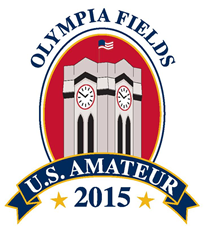 Olympia Fields host of the 2015 U.S. Amateur. DeChambeau came right out of the blocks with birdies on holes 1 and 2, to quickly go 2UP. But Bard came right back by winning the third hole and closed the gap to one. Then after the fourth hole was halved, Bard turned it up a notch and won the next three holes in a row to hold a 2UP lead himself. But Dechambeau chipped in on the 8th hole to close the gap back to only 1 DN. DeChambeau won the 10th hole with a par to bring the match back to All-Square, where it stayed through the 13th hole. On 14 DeChambeau took the lead for good with a birdie. DeChambeau’s lead went to 3 UP when Bard made bogeys on 15 and 16. DeChambeau had a chance to go 4 UP on 18, but left his approach long and in the deep rough, and first chip he left short of the green. Bard won the hole with a bogey and was 2 DN at the break. The Par 4, 12th hole for championship week at Olympia Fields, rated one of the best 4 par holes in America. Bryson DeChambeau closed out the championship on this hole. Then at the break, DeChambeau’s caddie had to quit with a foot problem, that was diagnosed as Plantar Fasciitis and a new caddie his assistant coach at SMU took over on the bag. Heading out to 19 with a 2 UP lead, Dechambeau pulled his tee shot into the bushes left of the first fairway. For a moment some thought the ball was lost on the adjoining railroad tracks, but just as the search was about to end, the ball was found and after climbing through the bushes, he hit a punch shot back to the fairway. The effort was not quite enough as bard won the hole and was only 1 DN after 19 holes. Bryson DeChambeau during his championship winner’s press conference. But things changed at that point. The misfortune on 19, only seemed to make Dehcambeau mad, and he fueled his fire and turned things around quickly starting on the 20th hole with a short birdie putt to go 2 UP. But the run didn’t stop there, DeChambeau then won holes 21, 22, 24, 26, 27, 28 to go 8 UP and Dormie. Bard didn’t quit, he made par on the 29th hole to extend the match when DeChambeau missed his par putt. The 30th hole saw both player reach the par 4 green in two shot after hitting approaches from the rough. But when both players missed birdie putts and settled for par, the match was over. DeChambeau will compete as part of the Walker Cup Team in England next month at Royal Lytham & St. Anne’s. The USGA announced the final five members of the Walker Cup Team, and they were Scott Harvey, Denny McCarthy, Mike McCoy, Jordan Niebrugge and Robbie Shelton. They join DeChambeau, Beau Hossler, Maverick McNealy, Lee McCoy and Hunter Stewart who were previously named. Click here to hear interviews with US Amateur Champion Bryson DeChambeau and runner up Derek Bard. The 116th U.S. 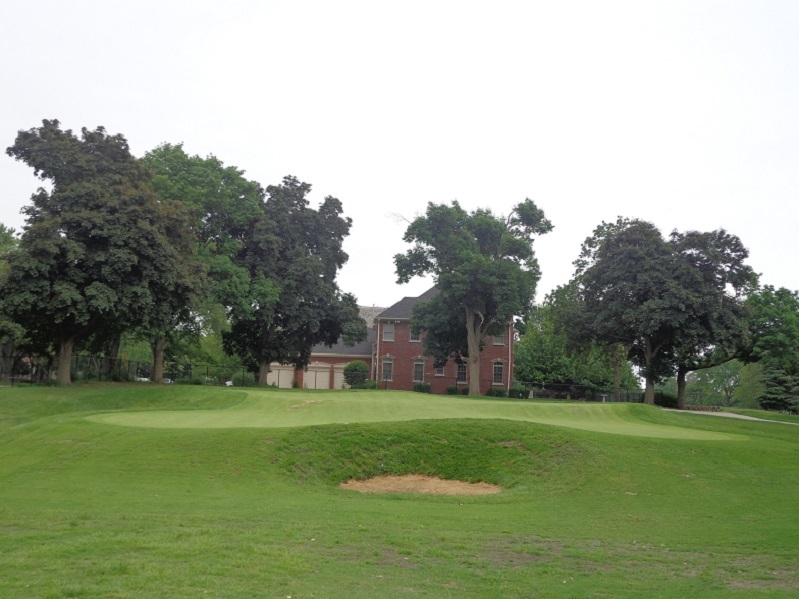 Amateur will be played at the Oakland Hills Country Club in Michigan. For more online information visit USGA.org.